Happy birthday Natalie Kinsey-Warnock (The Canada Geese Quilt). MLK Day is on its way. On this day in 1983, President Ronald Reagan signs a bill creating Martin Luther King, Jr. Day. People living in space! The first crew arrives at the International Space Station in 2000. Read Space Station Rat by Michael Daley. Circles are everywhere: in raindrop ripples, in some letters of the alphabet, and in children’s books. It’s Look for Circles Day so see how many you can find! Read So Many Circles, So Many Squares by Tana Hoban, and Pond Circles by Betsy Franco and Stefano Vitale. It’s November when Americans vote in national elections. November is also Picture Book Month, a time set aside to celebrate the need for picture books in the lives of children. Both causes merge in our book of the day, which both educates and entertains young people — just as good picture books should. Winner of the 2001 Caldecott Medal for David Small’s expressive and extremely funny illustrations, So You Want to Be President? by Judith St. George (revised in 2004) explores the backgrounds and personal characteristics of our nation’s presidents. Using telling details and fascinating quotes, St. George reveals one drawback of the job—people get mad at the president. Someone once threw a cabbage at William Howard Taft, who quipped, “I see that one of my adversaries has lost his head.” St. George also points out why someone would want to be president. One of the perks is living in the White House—with its own swimming pool, movie theater, and bowling alley. 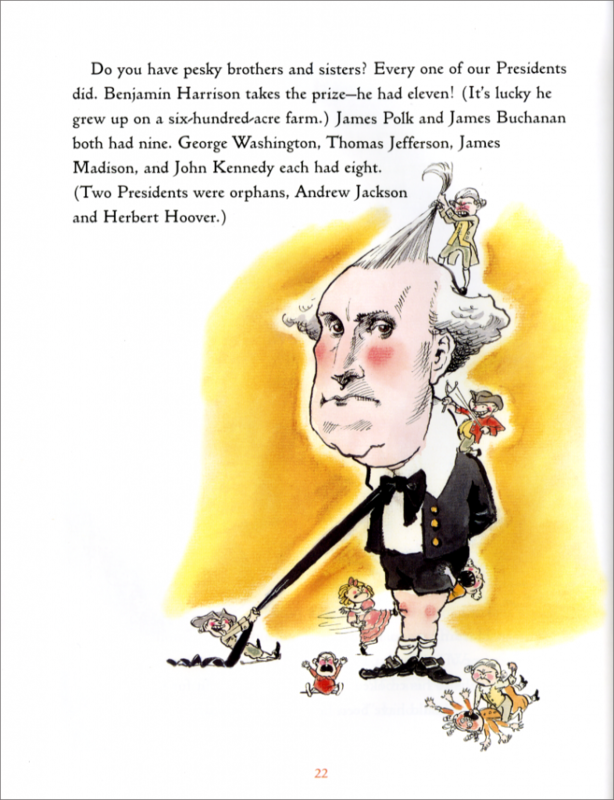 In this book we learn that our nation has a propensity for electing those born in a log cabin and how presidents come with a variety of personalities. Calvin Coolidge, shy and quiet, had a dinner guest bet that she could get him to say more than two words. “You lose,” he retorted. Clearly he also possessed a dry sense of humor. Presidents can be handsome or homely; Warren Harding may have been our best-looking president, but he once said, “I am not fit for this office and never should have been here.” In this extremely witty and clever text, St. George shows the quirks and eccentricities of those who’ve occupied the Oval Office. Even readers who consider themselves quite savvy about American history will find a lot of surprises here. Abraham Lincoln, a poor dancer, once said to his future wife, Mary, “Miss Todd, I should like to dance with you in the worst way.” She later said to a friend, “He certainly did.” One day while the very distinguished John Quincy Adams swam naked in the Potomac River, a woman reporter sat on his clothes and refused to give them back until he granted an interview. If you want to laugh about politics, rather than cry, pick up So You Want to Be President? It will give you, and the seven- to twelve-year-olds that you share it with, a lot of reasons to smile. Originally posted November 2, 2010. Updated for . Instructional materials from TeachingBooks.net for So You Want to Be President? David Small is so wonderful! I actually just took this off my shelf this weekend to read to my nephew. He wants to be president. Alessandria: Thanks for the post and support of the website.